These balls not only taste delicious but are really good for you too. 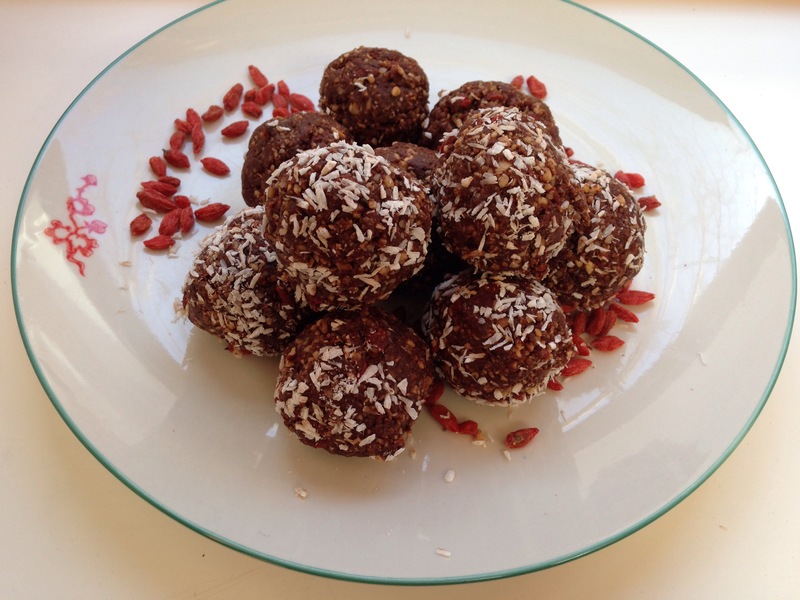 They are perfect to satisfy a sugar or chocolate craving and because they are dense with raw superfoods, these tasty bites are an excellent bridge between meals if you’re feeling peckish. You can use whatever nuts you like, walnuts, pecans, hazelnuts or a mixture. If you have time to spare you could activate your nuts. This process of activating certain foods removes the phytic acid. Nuts, grains and seeds produce this acid as a defence measure to protect themselves. This acid reduces the absorption of some nutrients in the food, iron for example. I’ll do a post on activation soon. Portions 10 – 12 bites. Blend the nuts in a food processor until broken to a thick crumble like texture. Add the goji berries and blend. Next blend in the dates. You can then add and blend the three remaining ingredients, desiccated coconut, raw cacao and coconut oil. Using your hands roll the mixture into 10 or 12 balls. Finally roll each ball in desiccated coconut and place in the fridge to harden for approximately 1 hour. Here’s the juicy bit. . . Raw cacao is a fantastic superfood. It is chocolate in its raw, unprocessed form. When we say chocolate is good for you, it is this raw cacao, which commercial chocolate is made from, that we are referring to. The milky, sugar laden processed chocolate bars in supermarkets are stripped of most of the valuable nutrients found in the raw cacao bean. Raw cacao is high in iron, & calcium. A 10g serving supplying 33% and 18% of the RDA respectively. It also contains good amounts of protein, fibre and vitamin C.
It rates very high on the ORAC scale ( oxygen radical absorption capacity), providing a rich source of antioxidants. Added to smoothies, homemade brownies or raw desserts, cacao is a tasty way to eat healthily. One Response to Raw chocolate energy bites.